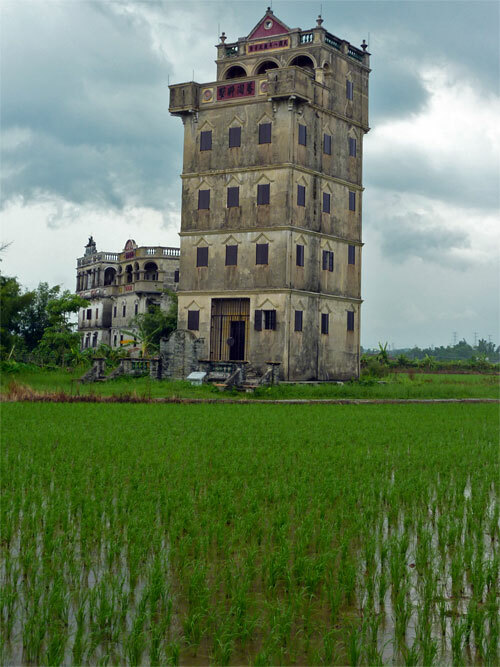 These amazing buildings sprout like giant mushrooms from the pretty paddy fields around Kaiping. Some structures are simple and plain affairs, others elaborate and ornate, the best are jaw droppingly beautiful. 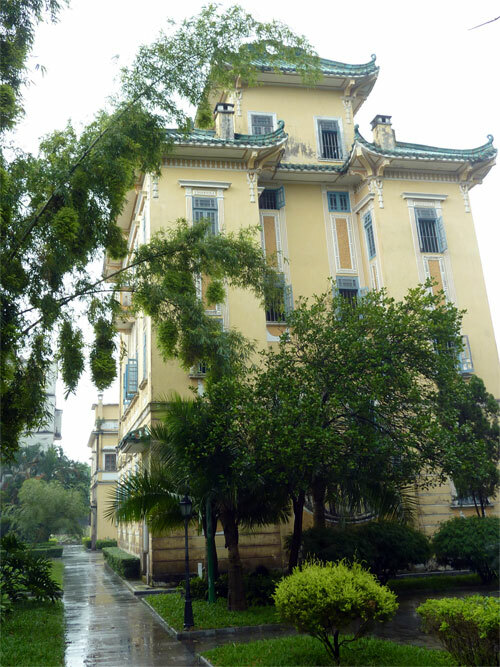 The Diaolou were mostly built by returning Chinese emigrants in the early years of the 20th Century, especially in the 1920s. Many reflect the styles of the countries where the émigrés went, like Malaysia, Indonesia, Europe or North America. Some of the Diaolou are a mix of different styles. Building a Dialou was a returning émigré’s way of showing the homeland that he had made it. However, at the same time, one of the principal functions of a Diaolou was defensive. China in the 1920’s was in the midst of the Warlord era. Internal conflicts and instability were rife. Bandits and remnants of warlord armies roamed the countryside, pillaging and looting. The Diaolou were used primarily as night watch-towers and as a way of sealing off and protecting the family from potential intruders and kidnappers. This was done by providing the towers with heavily fortified entrance gates, as well as the means of closing off each floor separately. 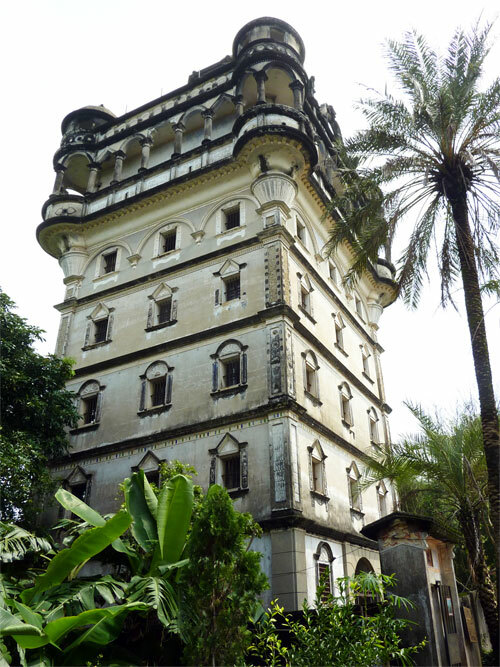 The more elaborate Diaolou were also built to display their owners’ wealth and prestige. Some have commemorative plaques, documenting the family’s history. There are stories of great patriotic heroism, others are of personal tragedies and incredible hardship. When the Japanese invaded China, many of the Diaolou owners fled abroad and never returned. 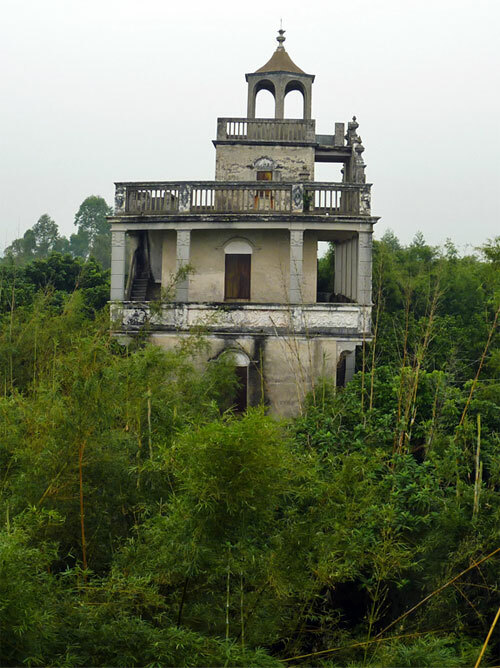 After the Chinese Revolution in 1949, the Diaolou fell into disuse and were all but forgotten until the 1990s. 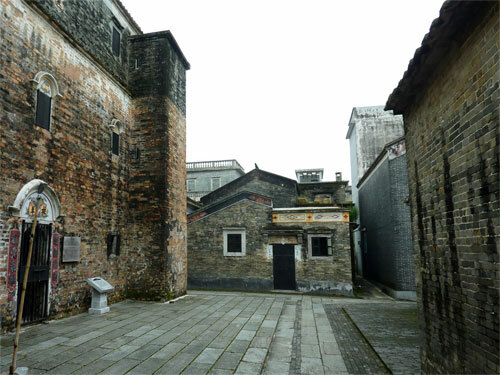 However, after a long campaign by Chinese history scholars, the Diaolou of Kaiping were listed as UNESCO heritage in 2007. Slowly, the descendants of some of the emigrants have been returning to restore the buildings. 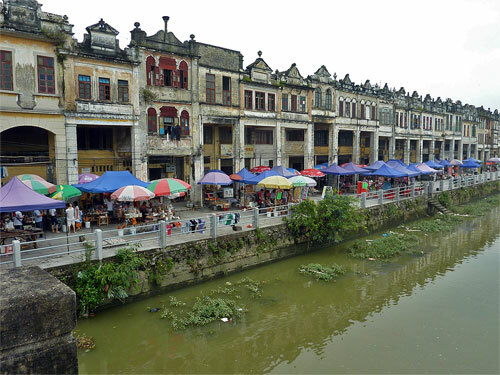 There are still over 1,800 Diaolou in the Kaiping region. 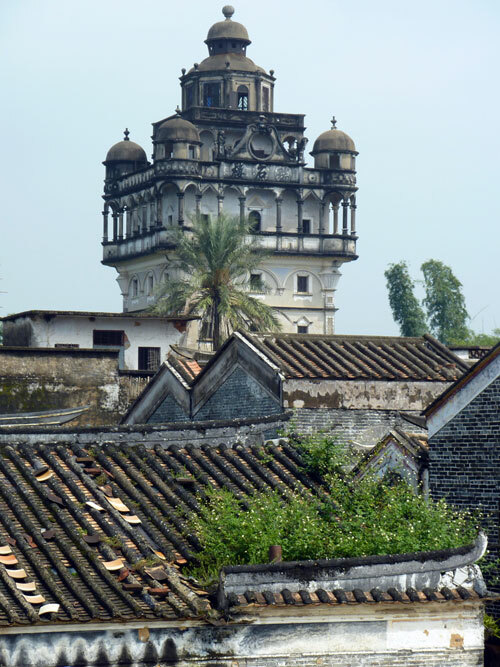 To visit the Diaolou, you first have to get to Kaiping, which is some two and a half hours by bus from Guangzhou. Kaiping is ugly; really ugly. Redeeming features are conspicuous by their abscence. As soon as we arrived, memories of grey Chinese industrial cities from our first visit in 1990 /1991 came flooding back. Even the potentially nice riverside walk way was a jumble of broken pavements, piles of trash, and half-finished buildings. 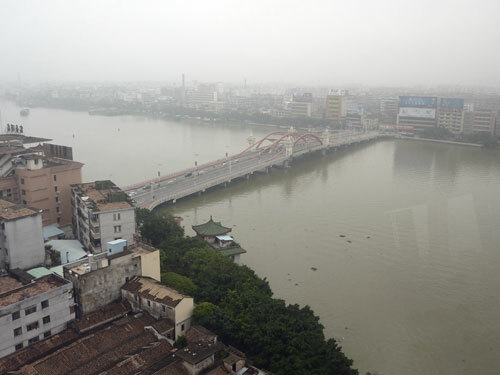 From the 17th floor revolving restaurant of the Kaiping Bingguan (hotel), the urban disintegration was all too evident: it was all grey dilapidated buildings and messy urban sprawl, as far as the eye could see. 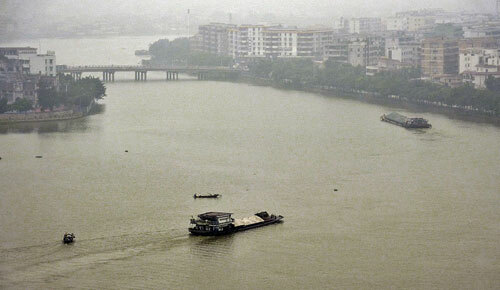 Even the Canjiang River, part of the Pearl River Delta, looked melancholy and devoid of nearly all river traffic; it had obviously seen better days. However, you come to Kaiping to see what is around it, not what’s in it. And though the city aesthetically is a disaster, Kaiping does have a few points in its favour: friendly locals, a couple of decent restaurants and a pretty good hotel. So, on arrival get hold of some transport and start exploring. 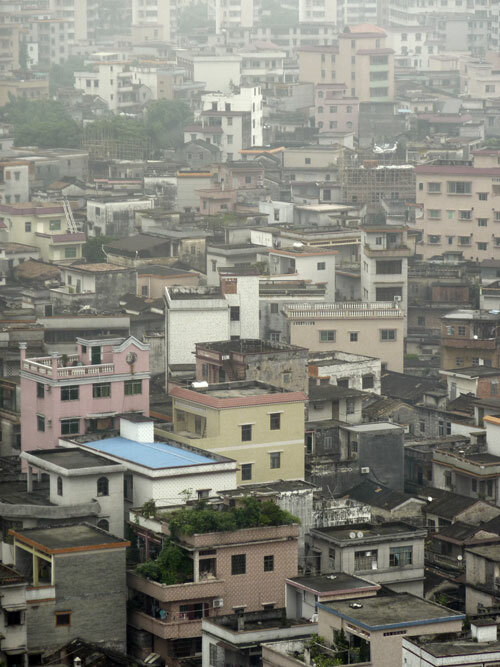 The Diaolou are spread out over a wide area around Kaiping. All places we mention can be reached by public transport from Kaiping. However, unless you want to spend about 3 or 4 days in the city, you might want to hire a taxi for a day or two. Drivers cruise around the bus station and will offer themselves for a day of sightseeing. We got the receptionist at the Kaiping Hotel to find us a driver. She obviously took some commission for her efforts. We hired the car and driver over two days and it came out at about 550 Yuan. That was for more or less two whole days of sightseeing and waiting time. One day might set you back around 300 Yuan, but you really need at least two days to take in the numerous sights and enjoy them. There are plenty of tempting places to stop for a beer or something to eat. Each village or Diaolou cluster has a rather expensive ticket at around 50 Yuan. However, you can also buy an all-inclusive ticket (Tong Piao 通票) for all the places, which is cheaper and remains valid for two days. We bought ours from the Kaiping Hotel, but we assume it’s available from other places too. The price was 165 Yuan for 5 places. You first pay the hotel and get a receipt, then, if you use their driver, he’ll sort out the tickets at the first site you visit. In the coming weeks and months we’ll be featuring each village individually, but here is a summary of the best Diaolou clusters. 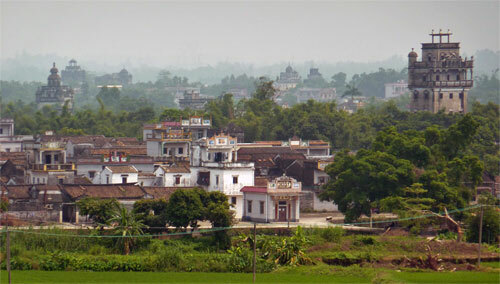 Just a few kilometers outside Kaiping, I saw this village from the car window and insisted that the driver enter it. 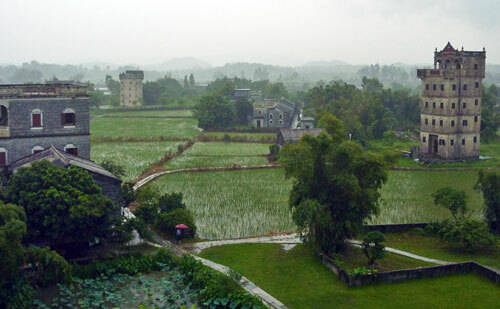 Sanmenli is not on the main Diaolou route, but contains some fine architecture and – apparently -the oldest surviving Diaolou, built back in the Ming dynasty. Sanmenli definitely makes a worthwhile stop. There is no entrance ticket here. Zili Village is the most popular village with Chinese tourists. It has some of the most beautiful Diaolou in a wonderfully idyllic setting. The vernacular buildings in the village are also very handsome. The Li Yuan Garden is another tourist hotspot (this is all relative; there isn’t much tourism here) with fantastic Diaolou and beautiful Western and Southern Chinese style gardens with canals and bridges. This is a marvellous place to wander; the Diaolou in Manjianglong aren’t the most spectacular, but the area is lovely. You can wander from village to village (almost without another tourist in sight) along stone paths shaded by enormous bamboo trees and stumble upon Diaolou hidden in the forest. The stone architecure and amazing roofs of the village houses add to the timelessness of the area. If you’re lucky, a Diaolou owner might let you in to explore their house. These Diaolou are the real McCoy; some still have ancient and unrestoreed farming implements lying around inside. This cluster of Diaolou has the most atmospheric and exotic buildings. It is slightly further out than the others, but the whole surrounding area and the buildings are absolutely superb. 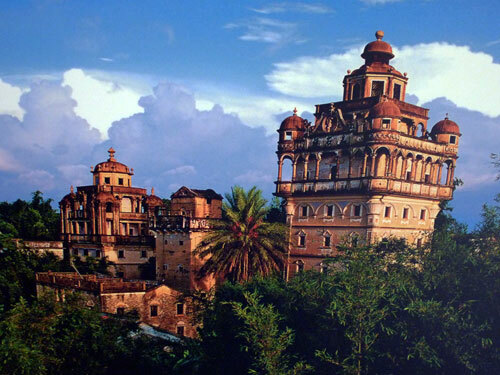 The historic and picturesque town of ChiKan has a wonderful riverside setting, some amazing classic Chinese early 19th century architecture, and a film city to boot. We stayed at the Kaiping Binguan. It’s a huge building on the waterfront. Rooms are big and clean and cost 265 Yuan for a double with a rather meagre breakfast included. A taxi from the new bus station costs 7 Yuan. 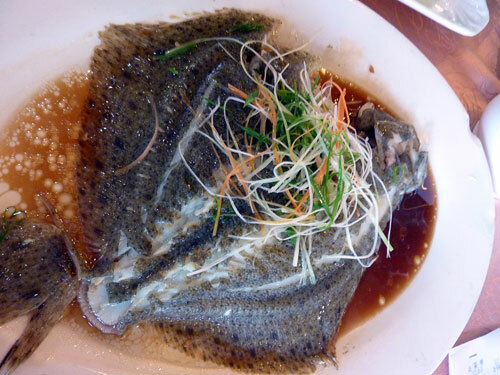 A hundred meters from the Kaiping Binguan on the second floor of what was once the Overseas Chinese Hotel is a buzzing Huoguo (Sichuan hot pot) restaurant, packed to the gills with locals and with a huge selection of ingredients (You need to be able to read Chinese to order from the menu). Getting to Kaiping is no sweat. Take a bus from any of Guangzhou’s bus stations. As we were staying on Shamian Dao, we used the nearby Fangcun bus station. To get there from Shamian Island take subway Line one from Huangsha and get off at Kengkou station and cross the bridge. There are hourly buses, 60 Yuan, 2½ hours. They leave you at Kaiping’s new Yici 义祠 bus station, which is a few kilometers from the central Kaiping Binguan and the waterfront. Regular buses from Kaiping also go to Shenzhen, Zhuhai, Zhaoqing (the one we took) and Hongkong.